BCS XI returned to the field on Saturday, April 30th to take on Kendall Wanderers C in Waltham, with the teams scheduled to meet again the following week in league play. This match represented the first round of the BSSL's cup competition, renamed last year as the McKenzie Cup. Both teams were struggling for results in the 3rd Division and were eager for a confidence-boosting win. In the end, BCS XI came out 3-0 winners and will advance to play Mass United FC (formerly Carico) in the second round on May 21st. This fixture will be a replay of last year's first round matchup. BCS started the match strongly by applying high pressure on the Kendall defense, not allowing the home team to string together passes or penetrate the BCS defense. Offensively, BCS moved the ball well across the back line and through the middle, but struggled at first to make their possession pay off. With Ramo directing from the sidelines, frequent substitutions were made to ensure energy levels stayed high and the team executed its game plan. Midway through the first half, BCS broke the deadlock. Beginning with a mis-placed pass from the Kendall centerback, Darren played a one-time ball to Matt, who flicked it on to Joe. Joe did well to out-muscle the centerback and shield off the goalie before laying it back to Matt, who finished well from the top of the box to make the score 1-0. The BCS defense held strong throughout the first half, with Kendall rarely threatening in the attacking third. Brad and Andy Hoot anchored the defense and made numerous well-timed interceptions and tackles. On offense, BCS continued to apply pressure, with overlapping runs from Nathan and Andy Vesper proving especially dangerous. The visitors' best chance to double their advantage came when Nathan whipped in a cross from the right-wing which found Matt's run, but he was unable to direct his header on frame. The halftime whistle shortly sounded, with the score still 1-0. Throughout the second half, BCS continued to maintain the majority of possession and make threatening runs into the box. Adam did well to maintain possession and play in the wingers, while Marco made mazy runs into the box and would have scored if not for an excellent recovering interception from the Kendall fullback. Logan, running onto a ball inside the box was taken down from behind in an NFL-style tackle while the referee swallowed his whistle. Numerous corners and crosses into the 18 resulted in half-chances, but BCS still couldn't find a second goal. On the other end, the defense endured several nervous moments as Kendall threatened to score on several occasions, but Dave and the defenders did enough to maintain the clean sheet. The game was finally settled with less than 15 minutes to go. Joe pulled the ball back from near the end-line, with Marco dummying to leave it for Darren, who calmly laced the ball into the side netting from the top of the 18. With the game finally killed off, nerves appeared much calmer, and BCS was soon at it again. Josh, who had previously come close to scoring with a fine header off a corner kick, capped the scoring with an excellent shot from outside the box; he chipped the ball into the far post, top corner, kissing the underside of the crossbar giving the keeper no chance. Stu also went close with a driven free kick from 30 yards. 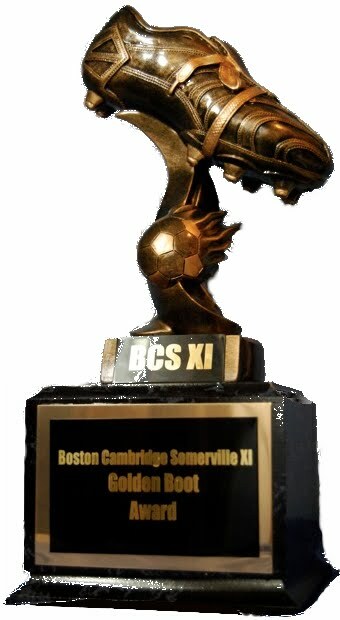 BCS will look to maintain their momentum in the cup in three weeks when they take on Mass United FC, while both BCS and Kendall will look forward to their matchup in the league next week. Based on the intensity and quality demonstrated in Waltham, it is sure to be a hard-fought match. Best of luck to both teams on May 7th.